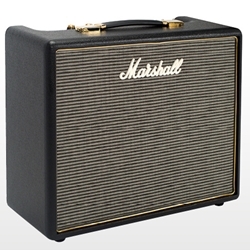 This Marshall Origin 5 5W amp is for the innovators. Using a classic all-valve design with contemporary features including a Celestion Eight-15 8” speaker this amp is unmistakeably Marshall. The rich and harmonic tone means that the Origin5 is suited to those looking to express themselves through their sound. A 2-way footswitch allows you to control the gain boost and turn the FX loop on and off. Ideal for the bedroom player, this single channel unit offers a diverse tone range from a clean, subtle tone to a bright, more cutting tone.